Akilisi Pōhiva, 76, has been elected by a majority of Members of Parliament Monday to become Tonga’s Prime Minister for the next four years. A total of 14 members out of the 26 Members of Parliament voted for Pōhiva, while 12 MPs voted for the rival candidate, Siaosi Sovaleni. Meanwhile, Lord Fakafanua has been elected as new Speaker of Parliament. 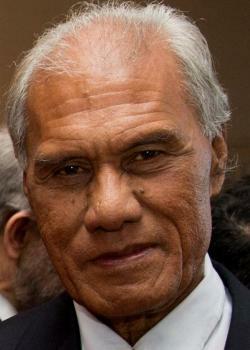 Pōhiva, who has led the PTOA or Democratic Party since its establishment in the last decade told the House before the election he was grateful to the people of Tongatapu for electing him to Parliament from 1987 to 2010 when the old electoral system allowed the whole of the mainland to elect three candidates to the House. He also thanked the constituents of Tongatapu 1 for voting him into Parliament since 2010 after the electoral system was changed to give Tongatapu 10 candidates to be elected to Parliament. After it was announced at about 6.30pm that he was elected as Prime Minister Hon. Pōhiva thanked the king and the people for putting their trust in him again. In his speech in support of Pōhiva, Pōhiva Tu’i’onetoa, Tonga’s Minister of Finance said the results of the snap election showed that the majority of people trusted Pōhiva and his ambition to have a government which supported good governance and justice. He said he supported Pōhiva to be Tonga’s next Prime Minister after his 30 years experiences as Tonga’s former Auditor General. Tu’i’onetoa said one of his roles was to watch on government leaders to make sure they were accountable to their responsibility for people. He then referred in his speech to some Tongan vocabularies such as “‘ikai toka’one” and “fōfō’anga” to describe previous government leaders saying they could not beat Pōhiva when it comes to principles such as justice and good governance. Another Party member, MP Mo’ale Fīnau, said he believed previous government’s upheld justice and good government, but they did not maintain a constant level of support. Finau believed Pōhiva stood firm in his desire to bring justice and good governance to Tonga more than any previous Tongan government leader. Fīnau said that in 2010 and 2014 the Democratic Party failed in its attempt to elect its 17 candidates or the majority of PTOA to Parliament. However, in the snap election they had won a majority of seats for the first time. MP ‘Akosita Lavulavu for the Party told the House that according to the snap election results the majority of voters in the Vava’u islands, Tonga’s second largest island group, wanted Pōhiva to become Tonga’s Prime Minister. She said God wanted Pōhiva to become Prime Minister and that was embodied in majority of the voters who went to polls in the snap election. She said he had promised her the government would help Vava’u in special way in the next four years. Niua MP Vātau Hui said the nation had been praying for an answer to the snap election and the results had been given that Pōhiva should lead the nation. However, MP Sāmiu Kiuta Vaipulu who nominated Sovaleni said MPs needed to work together to build the nation.